As I dropped my daughter off at Granny’s at 6:30am, en-route to Gansbaai and the Great Whites, she said to me, Mommy, please don’t get in the cage, I don’t want a step-mom. These insightful words from a 5-year old got me thinking about preconceived ideas, and the mis-perceptions that we all have, drummed into us from fiction books and film. As children perceive step-moms to be mean and evil, from fairy-tales such as Cinderella and Snow White, so we perceive Sharks to be mindless killing machines, from films such as Steven Spielberg’s Jaws. I decided there and then to approach my shark-cage diving trip with an open mind, leaving all preconceived notions behind, and make the most of the experience that Shark Diving Unlimited had to offer. We arrived at the Shark Diving Unlimited crew house, overlooking a thankfully flat sea and the picturesque Kleinbaai harbour, where our adventure vessel, the 12.5m Barracuda, was being prepared for our memorable experience. Over a hearty breakfast and steaming coffee to wash down the seasickness tablets, we signed the mandatory indemnity forms if this doesn’t give you second thoughts, then the DVD playing in the background, of Michael Rutzen, Shark Diving Unlimited owner, free-diving with Great Whites, just might. Michael is known for documentaries on both National Geographic and Discovery Channels, capturing his unique ability to interact with these apex predators of the ocean, outside the safety of the cage. After a briefing by Frank Rutzen, Michael’s brother, and skipper, we walked the few hundred metres to the harbour where Barracuda and her crew where waiting for us to board. Our group consisted of an assortment of foreigners, including a family with an 8-year old child, (who actually went into the cage). This was my last chance to back out, but I convinced myself that if Brad Pitt, Leonardo DiCaprio and HRH Prince Harry entrusted Frank to skipper them safely, then who was I to disagree. The stable Barracuda powered across the ocean for about 15 minutes, the staff chumming the waters with a pungent concoction of liquid and rotting fish heads as we went. The mixture of chum and engine fuel, threatened to make some passengers breakfast resurface. (I highly recommend taking seasickness tablets, available at the kiosk at the harbour). When Frank decided the spot was right, anchor was dropped and the cage lowered into the water and secured to the side of the boat. We were briefed on safety, with the number one rule being: I have only one word for anyone that doesn’t keep their hands inside the cage “Para-Olympic games”. This was in fact two words, but the message came across loud and clear. Within ten minutes, there were shouts of “Shark! Shark!” from the crew that had been trawling a large fish head as a lure, and pouring more of the putrid fish liquid overboard. We were lucky, sometimes it could be hours before the star attraction does its guest appearance. The first six divers quickly suited up, and entered the cage. My husband was one of the first in, this being old hat, as it was his tenth time shark-cage diving. The first visitor was about 3.8m according to Frank. There was great excitement as she approached the bait, with our guide luring her right in front of the cage for the divers to view, always keeping the bait just out of reach. (It is against the shark-diving code of ethics to feed the sharks.) As the spotters shouted Down! Down!, divers took a deep breath and dropped below the surface of the water to view what they had come to see – some of them from half way across the world. First a black shadow in the distance, and suddenly a gaping jaw and an intelligent eye as she honed in on the lure. with a thrash of her tail she made a rapid turn as the bait was pulled beyond her grasp. I had a seagull’s perspective from the viewing deck, and had my camera ready each time I heard cries of Shark! Down now!. The expressions on the faces of the divers as they climbed back onto the boat was that of pure exhilaration, as if they had ventured into an unknown world and lived to tell the tale. In total, five Great Whites were spotted on our trip, ranging in size from 3-4 metres. During the winter months, sharks feed in the area known as Shark Alley, between Dyer Island, home to over 50 000 cape fur seals, and Geyser rock. In the summer months, their feeding grounds move to the shallower waters of the bay, just beyond the breakers, where their diet changes to rays, smaller sharks species and migratory fish. Surfers and bathers will be flabbergasted at just how close to the shore they are. 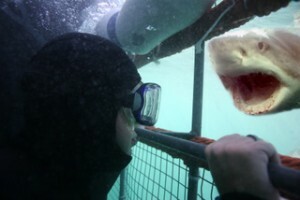 A shark-cage diving experience is one to remember. Adrenaline junkies can enter the cage for an underwater thrill, and not-so-brave eco-tourists or the just curious will get an equally enthralling experience viewing these powerful predators from the boat. Although I still maintain a healthy respect for Great Whites, I can now appreciate them with a higher level of understanding, obtained from the informative skipper, the documentary DVD of Michael Rutzen as well as observing these animals at such close quarters. No engineer could design a machine better purpose-built than nature has done with the Great White. With a combination of streamlined form, powerful muscles, fine-tuned senses and intelligence, I can see the fascination that mankind, and specifically the media has with these creatures. It is natural to fear the unknown. With knowledge, this fear moves towards respect, and a trip with a knowledgeable and ethical operator such as Shark Diving Unlimited will dispel myths and misconceptions, as I found out.